We continue our reports from the Outsound New Music Summit with the concert on Friday, August 1. This evening featured two very contrasting sets, both in composition and volume. The first set featured the duo of Teddy Rakin-Parker and Daniel Pearce. They performed new works by composer Renee Baker that were commissioned for the Outsound Summit. Baker’s compositions “use a wide range of graphics and cued micro-improvisations as a means to denote the various developmental stages of our planet’s evolution.” Musically, the result was a mixture of subtle sounds, often low in volume, with occasional bursts of energy and percussive elements. The latter worked particularly well for this duo, with the cello becoming a percussion instrument alongside the drums. If the initial set was subtle and focused on details, the second set was the complete opposite. Joshua Allen’s Deconstruction Orchestra was a loud event with no fewer than 22 instrumentalists on stage. The ensemble performed The Structure of Sound and Space, an original deconstructivist-inspired suite of cell structure game compositions. Allen conducted the group through gestures and a series of instructions on sheets of paper. The piece and the ensemble were described in advance as being “cathartic”. That characteristic was hard to discern, but they certainly were loud. It seemed that most of the ensemble was playing at the same time, creating a very thick, intense and sometimes chaotic texture; though there were points where subgroups performed and there were several solos by ensemble members. It was certainly a spectacle that had to be experienced live. The full ensemble featured Aaron Bennett, Sam Flores, Vinny Golia, John Ingle, Matt Ingalls, Josh Marshall, Dave Slusser, Rent Romus, Cory Wright, Peter Bonos, CJ Borosque, Matt Gaspari, Ron Heglin, Jeff Hobbs, George Moore, Matt Streich, John Finkbeiner, Henry Kaiser, Lisa Mezzacappa, Timothy Orr, and William Winant. Overall, this was a somewhat shorter program than the other nights, but it packed quite a punch. Today we review The Music of ChAnGEs: Variation VIII, a concert in a yearlong series by sfSound celebrating John Cage’s centennial. This particular concert, which took place at The Lab, featured some of Cage’s more adventurous and experimental compositions, including works involving electronics and noise elements. These more conceptual pieces involved use of simple electronics, household objects, or unexpected musical sources. The scores are mostly based on sequences of instructions with absolute or relative time scales. In addition to 4’33” (which was not on the program), these are among the most celebrated examples of Cage’s music, but also among the more misunderstood and even reviled. I fall unequivocally on the side of celebration of these more radical and pioneering works, and thus I was privileged to be able to participate in this concert myself as well. The pre-concert and intermission music featured an interpretation of One3 by John Leidecker (aka Wobbly). The piece contains the instruction to “arrange the soundsystem so that the whole hall is on the edge of feedback, without feeding back. The result is an abstract texture that goes from silent to occasionally quite loud at the unstable boundary, but the sound was also blended with the ambience of the conversations and commotion in the hall. The formal concert opened with Radio Music. In this piece, each performer is given a written part with a sequence of AM radio frequencies to which to tune his or her radio (traditional analog broadcast AM/FM radios are required to perform this piece, no internet or digital-broadcast radios allowed). What, if anything, is audible on those particular frequencies is of course up to chance – sometimes it is just static, while other times one tunes into an actual station. Additionally, the performers were free to walk around the hall and to interpret the flow of time among positions in their part. The result was a spatialized electronic music texture with the radios playing the part of synthesizers with noise generators, distorted sine waves, and the occasional sampled recording. Particular combinations of sportscasts, music and tuning noise could be quite humorous. This was followed by Music for Amplified Toy Pianos. Cage is often credited with bringing the toy piano into the realm of serious music with his 1948 Suite for Toy Piano. In Music for Amplified Toy Pianos, he pushes the instrument further with the use of contract microphones, amplification, and more percussive interactions with the instrument itself. Like Radio Music, the score involves a series of instructions, indicating the pitches to be played by each performer, when to perform a “sound effect” on the instrument, and when to change the level on the associated amplifier – but in this piece, the times are given in absolute units. This was my station for the performance, with my own toy piano that was rescued from curbside dumping in New York. It has certainly had a better life at CatSynth HQ, and then the opportunity to appear in a concert like this! Performing this piece accurately requires concentration – one must pay attention to the cues on his or her own part without being distracted by the other sounds. Nonetheless, like all ensemble music one is listening to overall sound. The texture of the piece is quite sparse, with individual disjoint notes punctuated by percussive sounds (hits, scrapes, etc.). The amplification changes add a strange sort of dynamic expression especially as the ear inevitably tries to pull together disparate parts into short phrases. There was not as much empty space in this performance as I heard on earlier recordings of the piece, in part due to our interpretation of the noise elements, which included longer-duration sounds like scraping a comb on the piano and the interaction of the amplifiers with ambient and electrical noises. It was a delight to play and to be able to at least partially listen to. The other performers for the piece included Kyle Bruckmann, Daniel Cullen, Tom Djll, Sivan Eldar, Matt Ingalls, and Hadley McCarroll. The final piece before the intermission was Living Room Music. Dating back to 1940, this was one of Cage’s earlier pieces and explores the use of household objects as percussion instruments. Ingalls was again seated behind the desk from 0’00” with the other performers (Matthew Goodheart, Tom Dambly, and Hadley McCarroll) arranged to either side. Despite what was radical instrumentation for a concert setting at the time, the rhythmic work seemed rather conventional, with repeated polyrhythms and other patterns from idiomatic music. It was the combination of the staging, to look more like a room in a house with the desk and books, and the timbres of the “instruments” that allowed the concept of the piece to enter the listening experience. Once one accepted the setting, then focus shifts to the rhythms. The concert resumed with Music for Six, a performance of Cage’s modular piece Music for _____ by six musicians, essentially the same ensemble that played Christopher Burns’ piece minus Burns. This is one the most flexible and reconfigurable pieces, even more of a “composition generating kit” than the others. Although the instrumentation for this performance was traditional chamber instruments, the piece calls for extensive use of microtones that push the instruments into different sonic territory. The most unusual instrumentation of the evening was in Inlets (Improvisation III). The piece called for three amplified water-filled conch shells, one conch shell played like a trumpet, and pre-recorded sounds of fire. The honor of playing the conch shells fell to Matt Ingalls, Tom Dambly and Tom Djll. There was much of the expected splashing and gurgling sounds that one would expect from the conch shells, but also surprising details such as short percussive sequences from the action of the water. These instruments were quite difficult for the performers to control, which makes the resulting music more unpredictable. At times it was also difficult to tell what was generated by the water in the shells and the fire in the recording, adding an aspect of “elemental ambiguity” to one’s enjoyment of the piece. The concert concluded with a performance of Cartridge Music. The piece has a similar structure to Music for Amplified Toy Pianos and Inlets, but distills the concept further to just modified phonograph cartridges – realized for this performance using contact microphones – and found objects. The piece unfolded with each performer rubbing his or her respective found objects against the microphones according to the timed instructions in the score. The resulting music was once again quite sparse, but with a wide dynamic and timbral range from the array of objects used, including Matthew Goodheart’s cymbals (a miniature version of the system he presented a few weeks earlier at the Outsound Music Summit), metal objects in a bowl played by Kyle Bruckmann, and many others. By following the changes in texture, density and volume, one can start to hear phrasing and form in the music. In listening to (and in some cases performing) the works in this concert with their emphasis on generative techniques, “compositional tools” and indeterminacy, I could not help but think of Fluxus, for which Cage was an important influence (though not technically a member). The connection to Fluxus provides a strong conceptual context as well as connection to visuals of the time and place where Cage created these works. Nonetheless, they all still stand out as excellent on a purely musical level in the concert setting, with sounds and textures that were quite enjoyable to listen to despite Cage’s undeserved reputation of writing impenetrable music. The concert was also well attended, with a full house packed into The Lab. A very successful night all around. 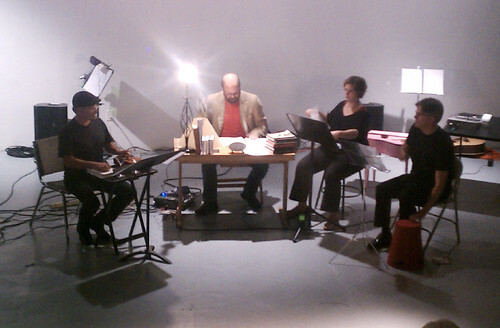 Today we look back at a recent concert at the Luggage Store Gallery that featured composer, performer and musical inventor Paul Stapleton in three improvisation sets with a variety of collaborators from the Bay Area and beyond. In all three sets, Stapleton performed on his “Bonsai Sound Sculpture” a contraption with various metallic and electronic elements, including bells, metal rods, a thumb piano and a turntable. While this provided a common grounding element for all three sets, it did not limit the variety of sounds or musical possibilities. It was apparent that Stapleton could explore quite a range of sound and musical structure within just a few minutes of the first set which also featured Ted Byrnes on percussion and Laura Steenberge on bass. The performance started off with frenetic motion before shifting into a software texture with gamelan-like sounds followed by percussive bowing of long tones. As the intensity ebbed and flowed, the most distinctive element was (for lack of a better term) the “turntable thingy” in Stapleton’s sound sculpture, though I did like the rhythmic work by Byrnes on the drums and how it played against the bells and other metallic sounds. The next set featured Stapleton together with Edward Schocker on Asian wind instruments and Matt Ingalls on clarinet and violin. I have only heard Ingalls on violin a few times, but this was the instrument he used to open the set. He was then joined by Stapleton bowing a section of the sculpture and Schocker on a small reed instrument that I believe was a pir’i – the small instrument packed quite a punch with wobbly tones the weaved in and out harmonically between the long bowed tones. This gave way to a period of high scratchy timbres and then an interlude of rough metal thumb piano and Ingalls on clarinet. Schoker also switched to sho, a free-reed instrument, in a section with Stapleton that was more drone-like There was a varied texture over all, but some exceptionally loud sections. The final set of the evening brought back Byrnes and Steenberge on percussion and bass, respectively, along with Matt Davignon on turntable and electronics and John Ingle on saxophone. Things got off to a staccato start, with lots of short notes, and turntable gestures. Indeed, one of the fun parts of this set was to hear how Davignon and Stapleton used their turntables differently, with Davignon using the instrument to manipulate recognizable recorded sounds with voices. The turntables also interplayed with cymbals and with vocalizations by Ingle. In addition to flurries of short notes, there were loud rough textures, a very “jazzy” moment, and static noise set against soft percussive tones. The evening went by quite fast, with each set relatively short. But I thought it worked well this way, keeping up the energy and variety. Say what you need to say, and then stop. And on that note, we sign off.